Somewhat surprisingly it is possible to buy really great fish in the Alps. It took us a while to find it and our supplier is a secret. So don’t ask. 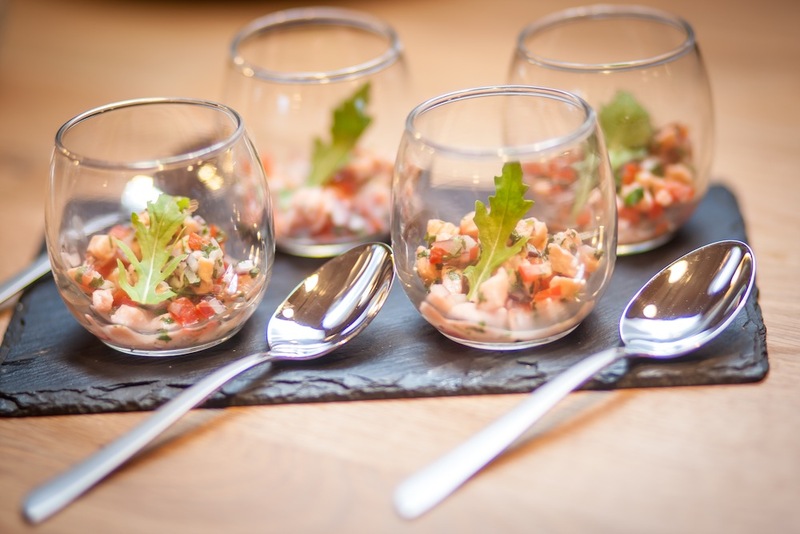 Salmon Ceviche has been a long time favourite as one of our canapes at The Tasty Ski Company. They’re delicious and we serve them in little circular glasses with just a couple of mouthfuls per person. Technically speaking, cooking requires heat, so ceviche, a dish in which raw fish is marinated in citrus juice, isn’t cooked. But it’s not exactly raw, either. Both heat and citric acid are agents of a chemical process called denaturation. We marinate the salmon in lime juice for 5 minutes before service – it firms up the fish while imparting it’s citrusy flavour that we combine with sugar, a little salt, and a few tasty extras. Combine the lime juice, water, sugar and salt. Cut the salmon into chunks being careful to remove any brown flesh. 5 minutes before you serve the dish, combine the salmon with the fish, chopped coriander, red pepper and red onion. Add to the glasses, add a small dollop of creme fraiche with a sprig of coriander on top. Enjoy!